It started as a delicious thought; Mother-Daughter baking and bonding time. 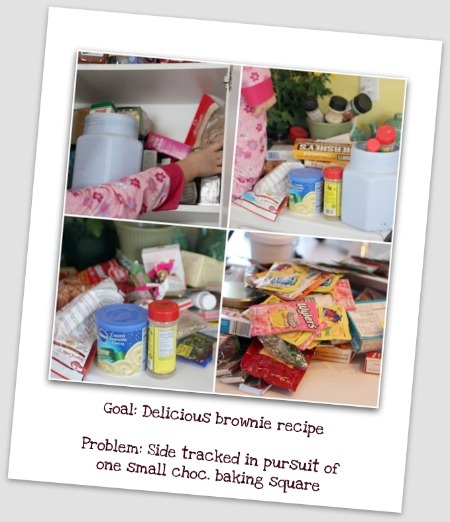 What better goal for a school morning that to conquer the perfect homemade chocolate brownie recipe. But alas, the recipe called for a chocolate baking bar. Hmm….it had been a long time since I needed one of those, but I KNEW that I had one in my baking cabinet somewhere, and I was determined to find it. One hour later, the chocolate bar was found, the cabinet had been emptied, and the unending processes of purging old spices, expired frostings, and who knows what other unique intricacies, had been completed. Has that ever happened to you? Have you ever started with a simple goal, and gotten side tracked so profusely that your entire schedule took a U-turn, as if life was a total tangent? Yes, mother-daughter baking and bonding time became mother (daughter quickly got lost) clean out cabinet because your pantry wasn’t organized time. And thus, the birth of the NO FOOD WASTE WEEK! It was terrible to see what got buried in my baking cabinet, and if I had to explain some of the spices? Whew – I think they were passed down from my mother, and from her mother’s mother. I made a commitment to myself to keep some of those items rotated more regularly, so that the newer items are put at the back, while the older items are brought forward. How is your NO Food Waste Week going? For brunch, I reheated some biscuits, and served “yokey” eggs on them. For snacks, my big boys went to open another new box of cereal, and I cried, “NO WAY. We are finishing the FOUR that you have already opened.” (Yes, I admit. There is a downside to being a Grocery Guru with an unlimited supply of cereal. )Today I didn’t make dinner because I was working on cleaning out some of the left overs. I had some baked ham from a few days ago, which we heated and served on the crusts (yes, I made them eat the crusts) of homemade bread. Drizzled with some honey mustard and lathered with butter, it was yummy. We have a lot of little things left over which won’t be enough to make a meal or even enough for snacks, so I am going to have to get creative this week. I hope you’re joining in the challenge of being more cognizant of it as well. P.S. Eventually we did get to the delicious homemade, fudge, brownie recipe, and it was a hit. My daughter rocked it! Recipe will be coming soon. Can’t wait for that Brownie Recipe!!! Thank you for your transparency, your authenticity. You are such an encouragement to me!!! Finding your blog was a gift from the Lord to me. It happened to me a lot. A few months ago I took some plastic dish pans and loaf pans (what ever fit in that particular cupboard and divided my baking supplies between them. Now spices are in their own bin and I look there before I buy new. My cupboards are tidy and I find things faster. Thanks so much for your blog!! I too have had those baking days that turn into cupboard cleaning days, feel soooooo much better knowing I’m not the only one! One solution I use for the little bits of leftovers is “leftover soup”. I just add everything (providing the tastes will be ok together) to a couple of cans of tomato soup. Add some pasta for filler and sprinkle some cheese and sour cream on top for a garnish. Yes, my husband has rolled his eyes a few times, but I’ve never had it turn out badly. Thanks again for sharing these parts of you life with the rest of us. So encouraging!! Yum! Now I want brownies. 🙂 And I totally get sidetracked. All the time. Just as an observation – all of the blog “redos” I’ve seen recently are going to the format where a reader has to click again to read the whole post. I’m not liking that because the extra click just takes more time for the page to load again and often by then I’ve missed the quiet minute I had to read. But maybe I’m missing the benefit of such a setup? Glad you found all the stuff in the back of your pantry! Trust me, that was my hardest decision with the re-do was the extra click. My preference is whole page, and that is the best option for people who read a blog faithfully, but considering that many readers are new through either google search or a referral, from a practical blogging standpoint, this is the best option. I tried to keep it where at least a portion of the newest post is at the top as opposed to just a few words. I may lose some readers, which will make me sad, but hopefully new readers will be drawn in because they see much more of what I have to offer. We have a ‘leftover night’. I pull all of the leftovers from the fridge, and put them on the kitchen table. The kids choose what they want, and make plates, which we warm up in the microwave! If there is anything leftover from that, it goes to the dogs, or geese & chickens. Usually there isnt much left though.